What happens when a Marine loses equipment in combat? 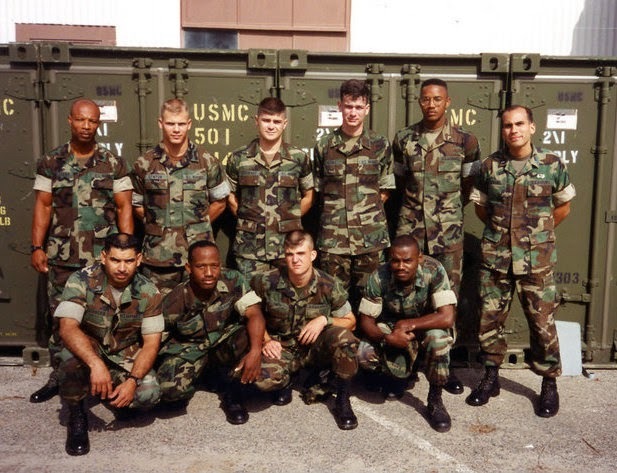 One of my jobs in the Marines was as a supply officer for an infantry battalion at Camp Pendleton, CA. The majority of our warehouse was stocked with "782 gear" (/seven-eighty-two/) which is individual combat equipment and field gear such as helmets, canteens, ammo pouches, flak jackets, etc. A Marine would check into our battalion and he'd receive his standard issue of gear. In the mid-1990s a standard issue was worth about $1,800. If any equipment became damaged or unserviceable due to routine use then it could be surveyed (one for one exchange) for a new piece of gear. The odd part was if a Marine lost a piece of GI gear he didn't have to pay for it, even during peacetime. It may seem strange that someone entrusted with tax payer equipment didn't need to pay for losing it but it makes sense. The idea is to promote aggressiveness. Or, more specifically, to not encourage passivity in combat. We don't want Marines to find themselves discouraged from attacking an objective if they get a bill for equipment lost in the attack. After all, we're talking about combat. And we fight like we train so the same rules, along with a high degree of safety, should be applied in peacetime. The formal process of filing a missing gear statement included having the Marine counseled by an officer outside his chain of command. During a counseling session the Marine would be encouraged to reimburse the government for the lost gear, but he was specifically told that he had no obligation. The Marine would make a written statement and the officer would certify his counseling session. During an audit, I'd have to produce this paperwork to certify the adjustment to our inventory records. There's a fair amount of paperwork involved in maintaining a chain of custody for government equipment. When I was a second lieutenant at Quantico (TBS) I lost an expensive pair of Gore-Tex gloves during a night attack. Out of a sense of duty I moseyed over to the supply section and wrote a $120 check made payable to the U.S. Treasury. The sad part is the Marine Corps doesn't recover any of these funds – my money went directly to Uncle Sam and, in return, I was told it came with the uniform. Semper Fi.